After teasing on all morning that “at 10am this morning, WINK-FM will become a thing of the past,” Fort Myers Broadcasting Adult CHR “96.9 WINK-FM” Fort Myers, FL has flipped to AC “96.9 More-FM“. The new format expands the station library to add 80’s artists to the previous “90’s, 2K, and Today” focus. The first song on More-FM was Journey’s “Don’t Stop Believin’” followed by Taylor Swift “You Knew You Were Trouble“. 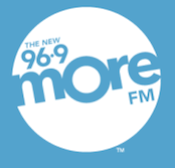 An application for the “More FM” trademark was made by Moyes Research Associates on March 29. Could this be the first of other More FM’s in the pipeline. With the change at WINK-FM, the syndicated Elvis Duran Morning Show will shift to Clear Channel’s “Y100” 100.1 WZJZ beginning Wednesday, May 8. Was the Elvis Duran move to Y100 already in the works before the flip? Not that losing a syndicated morning show would necessarily necessitate a format change (though it has before), but I’m curious if the Premiere/Clear Channel connection came into play in this situation. No prizes for guessing where they copied and pasted their new website from, the second listen live box still links to Nash FM….